Rajasthan Police has Release Marks of Written Exam held on 14th, 15th July 2018. In this examination 13912 post for recruitment. very large number of students involved in exams. we are provide here result for Rajasthan Police constable Marks District wize and Battalion Wise Cut-off Marks. 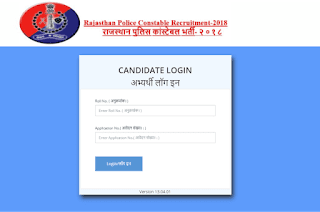 9 July 2018 - Rajasthan Police Admit Card Release on 6 july 2018, now all candidate can download admit card on official website www.sso.rajasthan.gov.in or Direct link given below important link section. Rajasthan Police Recruitment Department has invites Application Recruitment Job Notification offer for 13912 Post. Organization announce this vacancy this month Interested or eligible candidate can apply to this recruitment before 14.06.2018 . this vacancy for Police Post, if you want to apply this vacancy then it start in Next month and according to local Newspaper Rajasthan Exam will be held 15 July 2018. We are Provide here राजस्थान पुलिस भर्ती 2018 अधिसूचना recruitment Details; Raj Police Constable Notification download link, Rajasthan Police Constable Online apply link and other details age limit, pay scale, fees details, how to apply, Rajasthan Police Constable Syllabus, Rajasthan Police Constable old sample paper, Rajasthan Police Constable exam note etc. For Rajasthan Police Constable Recruitment Candidate Should be minimum Qualification 12th Pass. For more details download notification. as on June 2018 ( Upper age limit is relaxable by 5 year for SC/ST candidate & 3 Year for Obc Candidate and 10 year for Differently abled persons will be eligible for grant of cumulative age relaxation under both the category.